San Francisco is a national leader in sustainable urban development, having passed citywide ordinances on mandatory green building, recycling, and environmental ethics. To bring this same ethos to the complex subject of urban water management, the City has incorporated a number of “Green Infrastructure” (GI) projects into its massive, multi-billion dollar Sewer System Improvement Program (SSIP). To ensure the success of the municipal GI projects, the City provides contractor training on design guidelines and best practices. To date, 40 firms have completed the training program, including Madroño Landscape Design Studio. But unlike many of the larger firms which are engaged in more commercial and municipal projects, Madroño’s residential business sees the SSIP as a launching pad to engage private property owners more deeply in the larger vision of greening our city. So what is Green Infrastructure? In essence, it is a landscaping strategy that diverts rain into planted areas and eventually back into the water table, rather than sending it into the sewer. This method replaces impermeable surfaces like asphalt and concrete with permeable pavers and infiltration basins that allow rain water to percolate into the earth. Less water in the sewer means lower treatment costs for the city, less chance of overwhelmed sewers, and an overall recharging of the water table for improved plant and soil health. The City has found that optimal GI design prevents nearly 90% of stormwater from entering the sewer system. But Raphael Garcia, the Public Utilities Commission (PUC) GI Project Manager, spoke of the challenges still facing this issue: “Municipal projects can only go so far, as 80% of the impervious surfaces in this city are on private property.” This eye-opening statistic raises the question: what programs are in place to reach this vast and largely unaddressed majority of the city landscape? 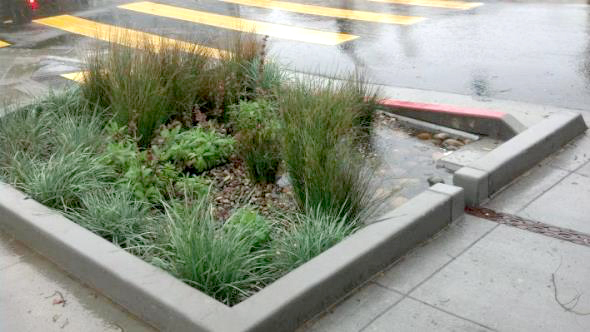 Continue reading Madroño Certified as Green Infrastructure Contractor →.